By Scott Gilfoid: Anthony Joshua is absolutely committed to having WBC heavyweight champion Deontay Wilder coming over to the UK for the fight rather than him fighting the American talent in the U.S.
Joshua says he’s worked too hard to get to the place he’s currently at as the IBF/WBA heavyweight champion to risk it all. He says that fighters that come to the U.S “lose control” and must attend a lot of press conferences and deal with interviews with the media. “I’ve worked hard to get to this position, and I want it in the UK,” Joshua said. ”Even if I was to take less or more [money], I want it in the UK,” Joshua said. So, there it is. Joshua is so against fighting outside of the UK that he’ll even take less money to stay in his own country to fight. I guess this means the $50 million offer from Team Wilder to him is no longer on the table, because Deontay’s team isn’t likely going to accept fighting in the UK if they’re the ones putting up the money. I’m not sure that Joshua understands the ins and outs of offers. When the opposing fighter’s management is the one that’s offering up the money, the fighter has to accept the venue of their choosing. Joshua seems to think he can still have it his way of fighting at home in the UK even though Wilder’s management are the ones that coming up with the money. ”Why wouldn’t he come to the UK? Everyone else has,” Joshua said about Wilder. Well, I think it’s easy to see why Wilder wouldn’t want to come to the UK after seeing Joshua’s last three fights against Joseph Parker, Carlos Takam and Wladimir Klitschko. Need I remind anyone how the referee that worked the Joshua-Parker fight prevented Parker from fighting on the inside, and how that crippled his whole game? Parker had the shorter arms and he needed to be able to fight in close, but the referee that worked the fight in Cardiff, Wales, wouldn’t let him to work inside. The referee kept pulling Parker off of Joshua each time he was fighting in close. Parker’s entire offense was effectively neutralized by the referee without Joshua having to lift a finger. Then there was the referee that worked the Joshua-Takam fight, who quickly jumped in and stopped the fight prematurely in the 10th after Takam had gotten slightly buzzed from a shot. Takam was still fighting back at the time the referee jumped in and stopped the fight. You could understand why Wilder wouldn’t want to fight Joshua in the UK after seeing those two fights. Then there was the Klitschko-Joshua fight. Wladimir had the fight in the bag in the 10th round when the cheering from the pro-Joshua fans motivated AJ to start throwing punches after he was on his to a big fat loss. If not for the crowd, Joshua would have lost the fight. ”I think people lose control [when they come to the U.S to fight]. Ask any UK fighter that has been to America” Joshua said. ”They lose control. They got 50 press conferences. They’ve got to do an American tour. You tire out in training camp. You’ve got the media and the obligations. When you’re overseas, you’re out of your comfort zone. That’s what people worry about when they’re fighting overseas,” Joshua said. Oh brother, Joshua is starting to sound like a real weakling with the way he’s bellyaching about UK fighters having to fight in the U.S. There is no such thing as “50 press conference” that foreign fighters must attend. As far as I can tell, there are two press conferences and then the final weigh-in. I don’t see how attending three media events is going to wear a fighter out unless he’s old and not able to recover from sitting in a chair in front of a group of reporters. It’s not like the fighter is doing pushups in front of the media or running in place. The fighters sit on a chair about an hour during the press conferences, and then give a few interviews for about an hour before going back to their hotel room. At most, we’re probably talking three hours. I don’t see how that could wear a fighter out unless they’re stressing out about it. 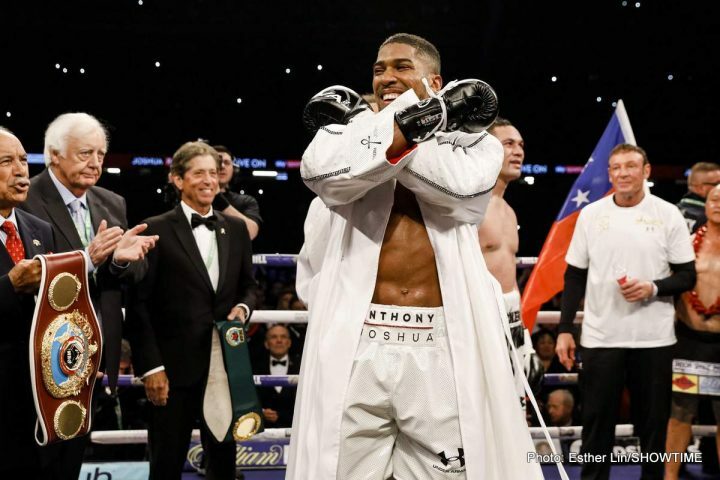 If Joshua feels like he owes his fans something, then he should give them the Wilder fight instead of negotiating his way out of the fight by insisting that it take place in the UK rather than the U.S. What Joshua is doing by rejecting the fight take place in the U.S is counter-productive to making the fight. I mean, there’s no way Wilder’s management is going to give Joshua $50 million to fight Wilder in the UK. That doesn’t make sense at all. My guess is Joshua’s promoter Eddie Hearn doesn’t want to relinquish having control over the Joshua-Wilder fight with the loss of the gate money and the money that comes from being in control of the event with the huge sponsorship green stuff. Joshua says it’s for the fans, but I think it’s more about the money that he can his promoter can make if they can keep the fight in the UK. You can argue that it Joshua if he can get the fight in the UK, because he can bring in a lot of fans in a huge 80,000 seat stadium in London or Cardiff. If there’s a referee like the one that worked Joshua’s last two fights against Parker and Takam, then that would play into his favor. It’s hard to imagine Wilder being given the benefit of the doubt and allowed to keep fighting if he gets hurt against Joshua like he was in the 7th round in his last fight against Luis Ortiz. If Wilder is hurt like that against Joshua, will the referee jump in and pull the plug on the fight if it takes place in the UK? I think for a lot of boxing fans, they would have doubts whether that referee would. Joshua wouldn’t have to travel if the fight takes place in the UK, which means no jet lag. He would have tons of his UK journalists smothering him with compliments and giving positive press, and not dissecting him for his many flaws. Joshua has never fought outside of the UK, and it would be tough on him to fight Wilder in the States with that being his first fight outside of the safe confines of home. For Wilder’s team to pay Joshua a $50 million guarantee and then wind up having to fight in the UK, it doesn’t seem realistic that they’re going to agree to that. It tells me that Joshua doesn’t want the fight with Wilder now. Joshua really wants the fight with Tyson Fury, whose June 9th opponent was announced on Sunday Joshua says he’ll wait for Fury to take his tune-ups before looking to fight. However, Joshua doubts that Fury will be the same elite fighter that he once was. “I don’t like what I see,” Joshua said about Tyson Fury. “He’s done well to get to where he was, but the game is not for the feint-hearted. You’ve got to be 100 percent dedicated. He’s been out 2 ½ years. At the elite level, you’ve heard the stories. For example, Muhammad Ali and [Sugar Ray] Leonard, when they took breaks, they were never the same,” Joshua said. I agree with Joshua about his view about Fury likely not being the same fighter. He’s 100 percent correct. Muhammad Ali and Sugar Ray Leonard weren’t the same fighters after they both took long breaks from boxing, and neither were George Foreman and many other fighters. I don’t think it’s possible for any athlete to get back to where they once were when they take two or more years. When an athlete is at an elite level, they need to fight often to stay in that position. The problem is that when top fighters start making good money suddenly, they want to live it up and enjoy that money by traveling, eating, buying things and unfortunately drinking. All that demanding work that they put into getting to that point is lost in a hurry. ”Hopefully, he’ll get a few tune-up fights,” Joshua said about a fight with Fury. ”After the Klitschko fight, I was the one saying straight after that Klitschko fight, ‘Tyson Fury, where you at?’ That’s the guy I wanted to fight. He had his issues, but if he can get himself back, and I think he deserves himself a warm-up fight or two to get that engine oiled and then we’ll scrap it up. I’ll fight anyone. That’s what I do. I went to the University of boxing. I didn’t go to study. I went to become a boxer. Tyson shouldn’t really talk because he actually is a drug cheat. Parker needs to watch what he says because I’ll knock him out next time. Bring a drug cheat and I’ll fight him and I’m clean. I’ll show you what a naturally clean fighter can do,” Joshua said.